Topics: Factory Floor, and Arlands Core Rulebook Pdf Release. 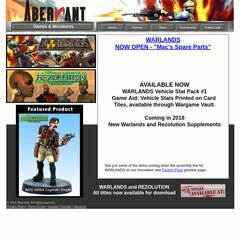 aberrantgames.com WARLANDS - Post Apocalyptic Miniature Mayhem! 26 users visit the site each day, each viewing 2.30 pages. There are 4 DNS records, such as ns8.san.yahoo.com, yns1.yahoo.com, and ns9.san.yahoo.com. Yahoo Inc (California, Sunnyvale) is the location of the YTS/1 server. Aberrantgames.com's server IP number is 68.180.151.96. A ping to the server is timed at 52.3 ms.